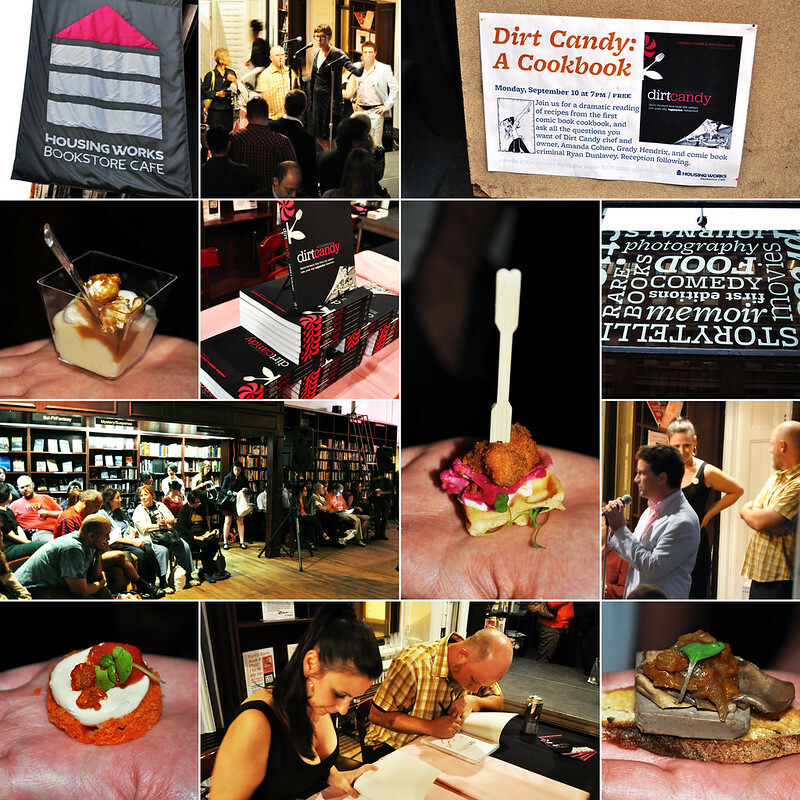 Last night, I went to the Dirt Candy Cookbook launch party with Christine and Marcus at the Housing Works Bookstore Cafe (had the pleasure of finding out about it through a Dirt Candy blog post!). The authors, Chef Amanda Cohen, Grady Hendrix (a journalist, who also happens to be her husband), and artist Ryan Dunlavey hosted the party to officially celebrate their new book's release, which had occurred only a couple weeks prior. Chef Cohen is the chef-owner over at Dirt Candy, a highly rated, all-vegetable restaurant in the East Village. She also happens to be the first vegetarian chef invited to compete on Food Network's Iron Chef America. Before her success at Dirt Candy (which opened in 2008), Chef Cohen had worked at many vegetarian restaurants here in New York City, including at Teany (i.e., Moby's teahouse) as its first chef. Other kitchen experience under her belt include Other Foods, Angelica's Kitchen, DinerBar (non-vegetarian), Pure Food and Wine, Heirloom, and Blossom Cafe. Her latest venture is the restaurant's eponymous cookbook -- in boldly striking comic book form -- tells the tales of the things that she has learned in a humorously illustrated way. Upon perusing the first pages whilst waiting for the event to begin, I couldn't help but laugh out loud (and I mean actually do so). It was really well written humor that got the point across effectively and coyly. Even one of the event attendees saw me laughing, and then stopped to say, "So I saw you laughing before -- were you reading the cookbook? Is it really that funny?" Indeed it is. The event involved a dramatic reading (in the style of coffeehouse poetry -- hilariously deadpan), Chef Cohen and her husband talking about the initial hardships they had before they finally became a running restaurant and a smashing success later on (great slideshow documenting such), as well as the editing/testing process behind the comic cookbook. Along with all that, there was PLENTY of hors d'oeuvres to go around -- about five different recipes served in bite sized portions for all attendees to sample. Plus, free booze (wine and beer). Christine and me, on the second level of the Housing Works Bookstore Cafe. 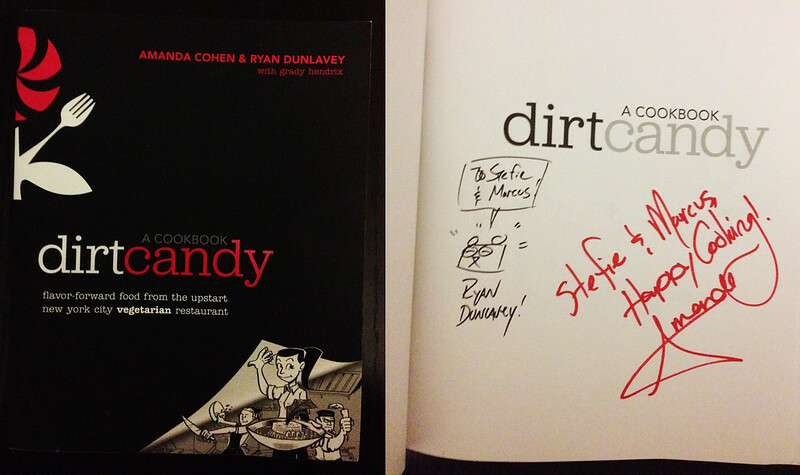 Of course, here's my signed copy of the awesome comic cookbook -- love how characteristic Chef Cohen's and Mr. Dunlavey's inscriptions are! So great! 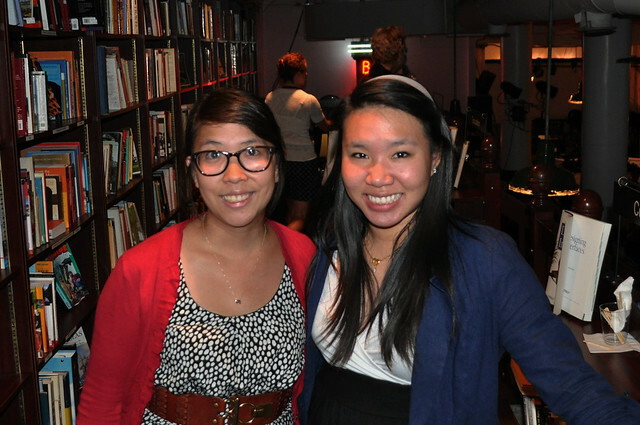 Findings: We had a great time at the Dirt Candy Cookbook launch party Housing Works Bookstore. It was certainly one of the best cookbook signings I've had the pleasure of attending to date. There was PLENTY of samples to go around (and not just one -- FIVE! ), and they were so radically different than most vegetable-centric dishes I've had (Ubuntu and Kajitsu come to mind) -- very creative and delicious (nothing like the stereotypes that perpetuate the idea of bland, boring, and "overly healthy"). The comic cookbook itself is such a novel idea, that I cannot wait to read it cover-to-cover. Thanks again to the team at Dirt Candy as well as at Housing Works Bookstore for throwing such a wonderful launch party -- it was the perfect way to celebrate this huge feat! Price point: $22 (including tax) for each book.